N.L.M. 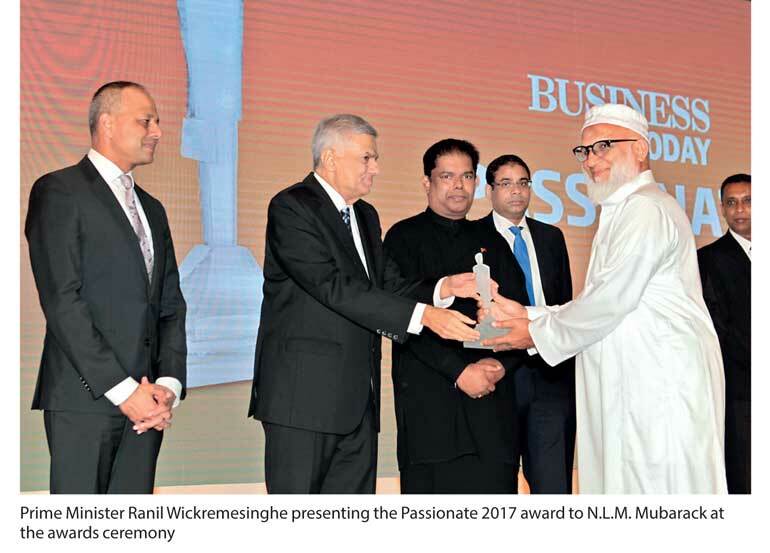 Mubarack, the founder of NOLIMIT, the leading fashion retail chain in Sri Lanka, was among the 13 individuals selected by Business Today magazine and presented with ‘Passionate’ awards. The Passionate 2017 awards was introduced to mark the publication’s 20th anniversary. The fashion retail stores he introduced in 1992 were driven by his entrepreneurial leadership. French Corner was the initial retail business which was rebranded in 2005 as NOLIMIT, which has now expanded to 21 state-of-the-art branches enabling customers to access the brand from convenient locations across the country including Colombo, Negombo, Kurunegala, Kegalle, Ratnapura, Panadura and Kandy. “As a company celebrating a quarter century of operations, we believe that everyone in Sri Lanka deserve to look good, feel confident and be upwardly mobile,” he said. Today the retail chain is a shopping destination which caters to the fashion needs of the entire family. In addition to NOLIMIT, there is Glitz, a lifestyle store, Pallu for ethnic wear and discount store Y Pay More. NOLIMIT has its own in-house design team that develops brands and also has products sourced from overseas as well as locally manufactured products to offer a wider range to customers. Mubarack invests in training and developing the staff and strongly believes that content employees will be committed to provide customers with good service. The fashion stores provide employment for over 1,800 people with a total of over 325,000 square feet of retail space making it the largest retail chain in the country.